3.7 sec. 3.4 sec. 3.4 sec. 3.1 sec. STaSIS supplies a complete line of performance-brake, suspension, driveline, and engine products for R8 vehicles leveraging race-bred technologies from in-house motorsports experience and top-tier race manufacturers. Our Signature Series packages create balance by ensuring all systems work in concert, integrating braking, handling, and engine performance so that your car drives like a racecar...but only when you want it to. Our technologies,derived from years of racing, achieve the optimal balance of comfort versus performance. The STāSIS Touring Edition R8 V10 delivers pure adrenaline—575 exhilarating hp with improved suspension response, faster acceleration, larger wheels, and a throaty exhaust. Combine it with the factory-matching warranty, and you get exotic performance and peace of mind. A STāSIS supercharged Challenge Extreme R8 V10 creates a road-devouring weapon, delivering an incredible 710 hp and 523 lb-ft of torque. With lightweight two-piece floating rotors and upgraded tires, the Challenge Extreme edition rockets from 0 to 60 in 3.1 seconds and stops on a dime. 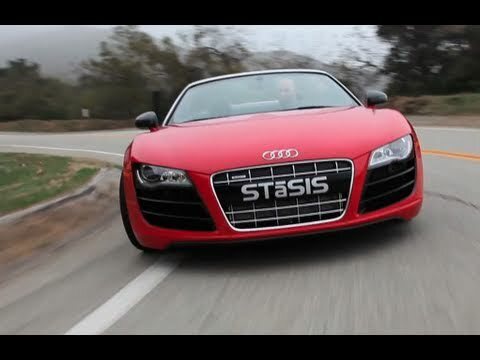 And STaSIS delivers the only R8 supercharger kits available in the world with a 4-year/50,000-mile warranty. For extreme enthusiasts only. Both Touring and Challenge Extreme Editions come with STaSIS Signature Series floor mats and STaSIS badges to complete the package. Read the story behind the black badge.